It's back! 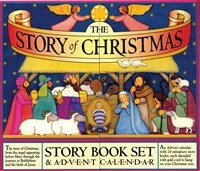 The Story of Christmas, the innovative Advent calendar, story book set, and tree-trimming keepsake. Carolyn Croll is the author and illustrator of Too Many Babas, The Little Snowgirl, and other children's books. She lives in Philadelphia. Mary Packard is the coauthor of The Story of Christmas Story Book Set & Advent Calendar.